My kids are grown and probably coping with the myriad of mistakes this cracked pot made as their mom, but, in spite of this, I’d like to share a Kid’s Life List. 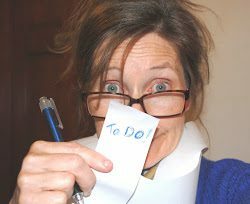 This list is evidence: those who cannot do, teach (or write blogs). 1.___Faith – Be sure to live it out loud. Ask forgiveness (from God and your child) when you blow it. Your child needs a foundation in God’s love. Say: God has a plan for YOU! 2.___Limits. Show your love through limits. Moaning and groaning aside, your child is truly asking: “Do you love me enough to say no?” A child gains security when rules are in place. 4.___Discipline -Help your child understand expectations and consequences AND follow through. No kid needs wimpy parenting. 5.___Failure & Forgiveness – Please let your child fail. Don’t fix all her messes or interfere with every consequence. Then: show grace and forgiveness as you help your child solve her problem. 6.___Vision & Victory – Encourage your child to dream big. Cast a vision of victory…with the help of a BIG God! Good stuff Laurie! Thank you!